Great Expectations is hailed as Charles Dickens’ masterpiece. A gripping tale of love and loss, aspiration and moral redemption, the story follows the young orphan Xiaomao (Pip) from poverty to a life of unexpected opportunity and wealth. The story has been adapted from Victorian London of the 1800’s to modern-day Shanghai, China. Both periods feature stark contrasts between the old and the new, the wealthy and the poor. The following is a list of the characters from this Chinese story followed by their corresponding English names from Charles Dickens’ original story. The names below are not translations; they are new Chinese names used for the Chinese versions of the original characters. Think of them as all-new characters in a Chinese story. Another great book in the mandarin companion series. It’s available on Kindle and the quality is great. The stories are well written and the interpretation into modern Chinese of classic European and American books adds additional interest to an already great set of books. I just wish there were more! Fantastic! It flows easily the new vocabulary is repeated enough that it starts to become familiar. Really enjoy the cute watercolour illustrations as well – it’s nice motivation to read to the next picture. I wish that some of my Chinese classes had used these books. Please produce more stories! I really enjoyed this book. I own and am currently working through a number of graded readers. For the Mandarin Companion series, the Chinese Breeze series is a natural comparison. Because Mandarin Companion uses real stories in the public domain, they are of a MUCH higher quality. Though it’s greatly simplified from the actual story, because they used Dicken’s story, it’s really quite gripping! Even though it’s a more basic version with a restricted set of characters, I definitely found myself involved in the story, which is ideal for something that you want to use to study a language. So if you’re making your way through the hanzi, I whole heartedly recommend this book! A few months ago, I discovered Mandarin Companion with their series of Level 1 graded Chinese readers. I read through all of those and was eager for Great Expectations as their first Level 2 book. 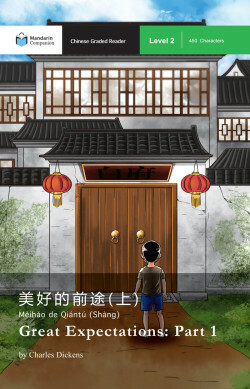 This book, and the whole series, is great for intermediate students of Chinese to practice their reading skills. The books use the ‘extensive reading’ concept and fully accomplish their aims of providing fun and enjoyable stories, with relatively easy text and vocabulary. Each chapter provides a handful of challenging vocab words and grammar structures within the story that help you learn as you read. These vocabulary and grammar are repeated naturally throughout the text to reinforce your learning. I really liked this book and I would recommend it to anyone looking to improve in the Chinese Language.